Leaflets and order forms to acquire extra uniform on-line will be distributed with the uniform bundles in August. Any student who has missed their uniform sizing appointment at the Academy can be measured on these days and collect a bundle at the same time– Trutex will bring changing booths to enable this to happen. If students have changed in size since being measured they will be able to try uniform on and swap it for another size as Trutex bring extra bundles with them. 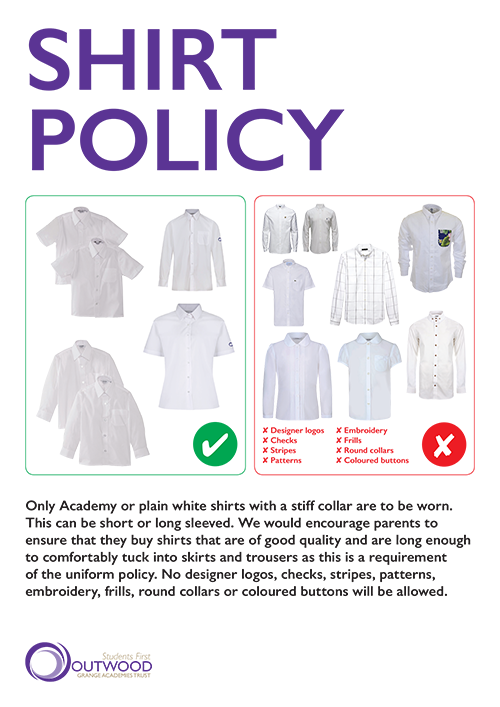 There will be links put on the website for extra uniform that can be purchased – plain white shirts can be purchased anywhere as long as they have a stiff oxford collar, a top button and can be tucked in. We are aware that some parents/carers are unable to make the August dates due to holidays so Trutex will leave any uncollected bundles in reception where they can be picked up on September 2nd during the staff INSET day.